Crazy for Contests: My Second Digital Camera I Won! Yay! My Second Digital Camera I Won! Yay! I received my second prize that I won in the Ship Your Way to the NBA with FedEx® Contest! When I won it said that I had won an 8 MP Digital Camera, but to my surprise when it arrived it is a 10.0 MP! 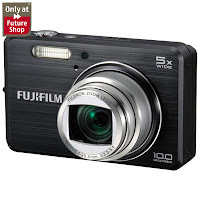 It is a Fuji FinePix 10.0MP Digital Camera (J150W). The camera retails for 199.99 at Future Shop. I'm so happy I got a new camera! I'll be keeping this one for myself and selling the first one I won. It is a very nice looking camera!